Thus begins the Underworld U.S.A. Trilogy. It's James Ellroy's pop history of the 1960s, his window-peeper's view of government misconduct, his dirty trickster's take on the great events of an incendiary era. It's a tour de force of the American idiom, and an acknowledged masterpiece. American Tabloid gives us Jack Kennedy's ride, seen from an insider's perspective. We're there for the rigged 1960 election. We're there for the Bay of Pigs fiasco. We're the eyes and ears and souls of three rogue cops who've signed on for the ride and come to see Jack as their betrayer. We're Jack's pimps and hatchet men, and we're there for that baroque slaying in Dallas. The Cold Six Thousand takes us from Dallas to Vietnam to Memphis to the kitchen of the Ambassador Hotel in L.A. We're rubbing shoulders with RFK and MLK, calamitous klansmen, noted mafiosi. We're forced to relive the American sixties--and we come away breathless. JAMES ELLROY was born in Los Angeles in 1948. 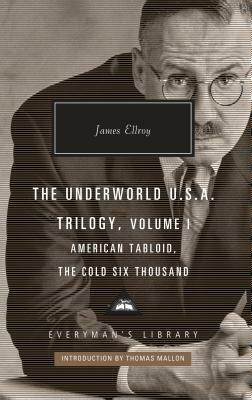 He is the author of the Underworld U.S.A. Trilogy--American Tabloid, The Cold Six Thousand, and Blood's A Rover--and the L.A. Quartet novels, The Black Dahlia, The Big Nowhere, L.A. Confidential, and White Jazz. He lives in Colorado.